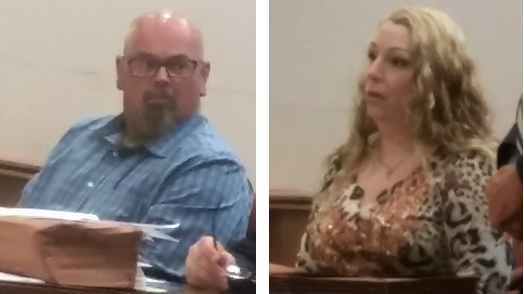 A former husband and wife pleaded guilty Wednesday to their part in a drug ring tied to Dr. James Kauffman. Cheryl Pizza and Glenn Seeler said they would get prescriptions from Kauffman, even though they had no medical reason for the drugs. Pizza, 37, who moved to North Carolina with her then-husband in 2014, would get prescriptions for Oxycontin that she would then give to Seeler she said. Seeler’s visits to the endocrinologist for his diabetes would include getting 120 Percocets, he told the judge. He would get to keep half the 30 mg. pills, and turned the rest over Ferdinand Augello. He said this happened once a month for about three years. Augello “would hand them off to somebody else to sell,” Seeler said. Eight people were arrested on racketeering charges in the case. The enterprise was allegedly led by Kauffman and Augello, a former leader in the Pagan Motorcycle Club, according to the charges. Augello is jailed on charges of murder for the killing of Kauffman’s wife, April, who was found dead in the couple’s Linwood home May 10, 2012. James Kauffman allegedly put the hit on his wife after she found out about the drug ring and threatened to expose it. The doctor was found dead in his Hudson County Jail cell from an apparent suicide. He had been moved there for his protection because Augello was trying to have him killed, according to the charges. Augello has vehemently denied this claim. Seeler, 38, pleaded guilty to second-degree racketeering, but could be sentenced under third degree. His attorney, Tim Riley, also can argue for a suspended term at sentencing. Pizza, who now lives in South Carolina, faces a three-year term with no minimum. She can also argue for a suspended sentence at the time of sentencing. Pizza was the first to plead Tuesday, implicating Seeler. The two could not be in the courtroom together since Seeler has a restraining order against his former wife, who was previously charged with shooting him in North Carolina. Pizza and Seeler bring to three the number who have pled in the case. All have agreed to give truthful testimony at trial, which is set for Sept. 11.